A layer of pesto under some fresh mozzarrella makes a simple pizza taste extra special. I love to use my Asiago Pesto Spread and add whatever I happen to have on hand. In this case, it was a few dabs of leftover Summer Tomato and Leek Sauce and Parmesan Zucchini Bites. You may add chopped, fresh tomatoes and zucchini if you like. Or include some roasted garlic, fresh greens, and a bit of Parmesan or Asiago cheese. For the crust, I enjoy a whole wheat version, but you may use all all-purpose flour if you prefer. I also make these pizzas using a cup-for-cup substitute of my gluten-free flour blend and they turn out beautifully. You may roll or stretch the crusts extra thinly if you prefer a crisp crust. Just go light on any sauces, in that case, to avoid a soggy crust. This crust is an ideal vehicle for all sorts of cheeses, pesto, prosciutto, greens, etc. These pizzas can be simply topped in so many delicious ways. 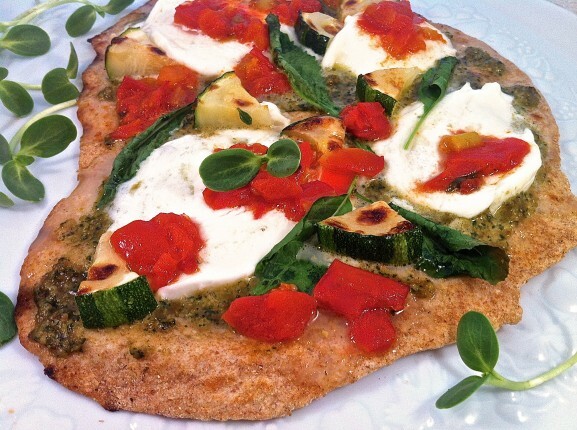 For the Garden Pesto version, spread a thin layer of pesto on the grilled crust, and then top with thin slices of fresh mozzarella and several dabs of fresh tomato sauce. Zucchini, spinach, kale, and chard are all good choice, too. In a measuring cup, combine the water and olive oil. Make a well in the center of the dry ingredients and pour in the water and oil. Stir the flour into the wet ingredients, incorporating all the flour. Mix until dough forms a ball. Add an extra tablespoon or so of water, if needed. Have grill cleaned and preheated to medium-high heat when ready to cook. 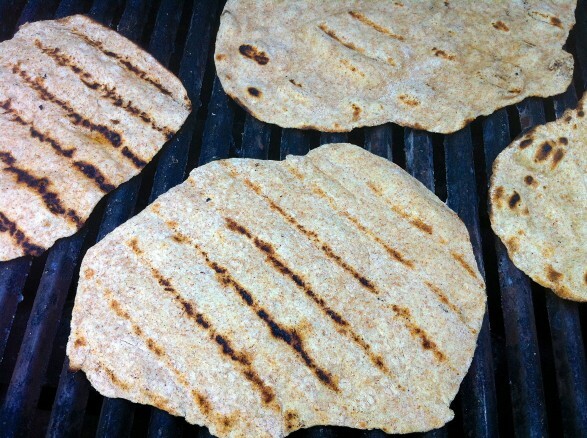 Place prepared dough on grill and cook until marks form and turn to the other side. This doesn’t take long; I peek underneath and flip as soon as I see the dark grill marks. When dough is slightly crisp, remove pizzas from the grill and top as desired. You may put topped pizzas back on the grill over indirect heat to warm the toppings. I often prepare the pizza crusts in advance and finish off in a 425-degree oven for 3-4 minutes to melt the cheese. The dry ingredients, yeast and all, may be mixed in advance and stored in a zipper-top bag in the refrigerator.